The stunning shimmer of sterling silver and diamond cut edges can be yours with this stunning Oval Color Photo Pendant. The intricate design and shape complement each other well in this beautifully stunning piece of fine jewelry. 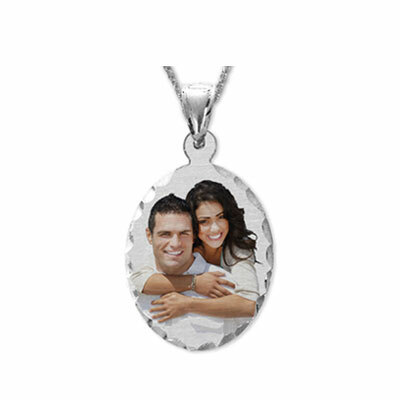 Measuring in at 1.15" x 0.77" the oval shape accommodates a color photo of your choosing and the pendant is lined with details etched by diamonds for superior shine and beauty. This pendant compliments any look and style. A perfect addition to any collection, the Sterling Silver Oval Color Photo Pendant with Diamond Cut Edges is a great gift to give at any special occasion. The beautiful cut design this simple pendant charm stand out among all others. We guarantee our Sterling Silver Oval Color Photo Pendant with Diamond Cut Edges to be high quality, authentic jewelry, as described above.